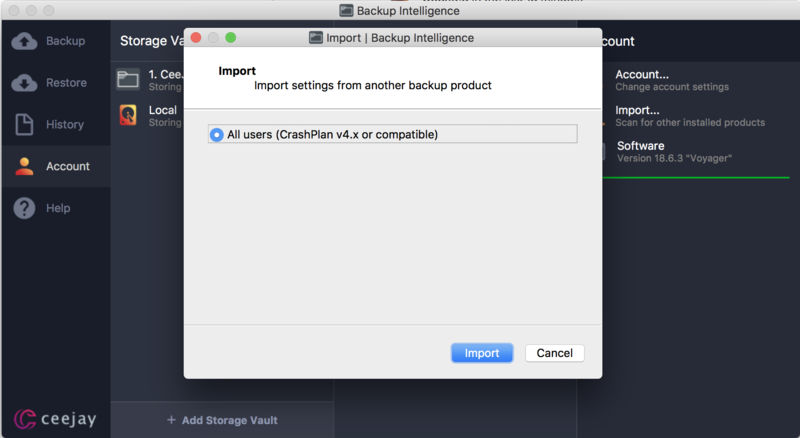 Backup Intelligence allows you to import your unique backup settings from CrashPlan so you do not have to enter them again. You will still need to start a new backup from scratch once completed. To do this click the Account tab on the left dashboard then click "Import" on the right side of the client. From the new window select CrashPlan, then click the "Import" button to begin. the operation has completed you should see your CrashPlan settings generated as a new Protected Item. We recommend double checking the settings in this Protected Item to make sure they are suitable.